Dr. Rick Ezell officiated at the marriage of Anna Louise Waters to William “Mack” Rains at Locust Hill Baptist Church. Following the 2 p.m. ceremony on June 26, 2015, the parents of the bride hosted a reception in the Fellowship Room of Fairview Baptist Church. Wedding music was provided by Mr. Charles Harris, uncle of the bride, and Ms. Amy Kinney, as soloist. The former Miss Waters is the daughter of Louis and Pam Waters, of 103 N. Miller St., Greer, and granddaughter of Mrs. Doris Blosser and the late Mr. Ralph Blosser and the late Mr. and Mrs. B. B. Waters, Jr.
Having earned a BS degree in Nursing from Carson-Newman University, she is employed at the University of Tennessee Medical Center as the Blood Management Safety Coordinator in Knoxville, Tennessee. The groom is the son of Jim and Susie Rains, of Caryville, Tennessee, and grandson of Mrs. June Luttrell and the late Mr. and Mrs. Albert Raines and the late Mr. Mack Luttrell. Mr. Rains is a US Navy veteran. He earned an Associate’s degree in Contemporary Management and is Production Manager at Nanomechanics, Inc., in Oak Ridge, Tennessee. Given in marriage by her parents, the bride selected a white satin gown fashioned with a strapless empire waistline trimmed in a wide band of lace and sequins which finished the design by a back sashed bow. Her simple, yet elegant satin skirt fell into a chapel train. Made from her mother’s wedding veil, the bride’s draped covering of net was held by a pearled comb. Trimmed in a pearl design, it fell to finger-tip length. The bridal bouquet consisted of white roses amid yellow daisies tied at the stems in white ribbon. 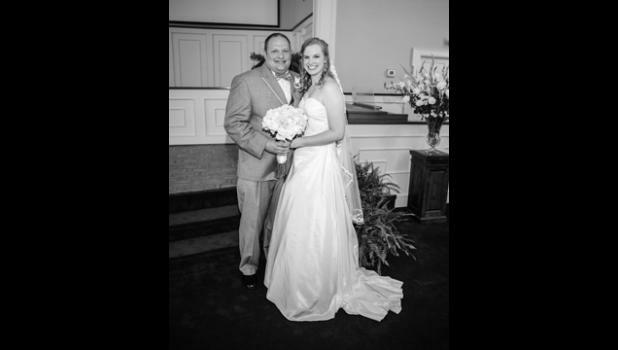 Suzy Sawyer, of Maryville, Tennessee, served as the bride’s matron of honor. Elizabeth Cook, of Charleston, Liza Price, of Greer, Cari Allen, of Greeneville, Tennessee, and Lauren Godfrey, of St. Petersburg, Florida, stood as bridesmaids. Their navy dresses were enhanced by pearl earrings and bracelets, gifts from the bride. To offset their ensembles, they carried nosegays of yellow roses touched by baby’s breath, wrapped by navy ribbon. Attending the groom were his brother, Anthony Rains, of Prattville, Alabama, Jim Rains, the father of the groom, of Caryville, Tennessee, and Connor and Christian Richardson, nephews of the groom of La Follette, Tennessee. The couple traveled to Savannah, Georgia, and is now at home in Caryville, Tennessee.